The Battery Saver 24 Volt 50 Watt Charger and Maintainer features our integrated micro-processor controlled automatic maintaining, automatic PULSE desulfator and modular cabling system. This provides a much more efficient experience when dealing with multiple batteries found in a 24 Volt system used in some RVs, Golf Carts or any other maintaining needs you may have. The power benefit of the 50 Watt model is the ability to charge up multiple batteries if they are connected together in series or in parallel. The advanced computer control will monitor to make sure that no matter the size of the battery, it will be charged safely and efficiently. The modular cabling system is unique to our chargers and maintainers and allows our units to run longer lengths than any other device on the market. 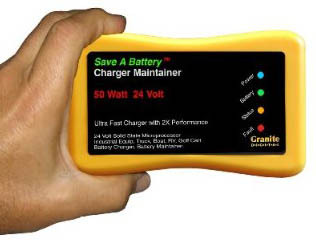 The Save A Battery 24-Volt Battery Charger and Maintainer is one of the most versatile battery charging devices on the market. It not only charges batteries quickly, but also maintains and conditions them. This compact unit is highly portable, and the innovative modular cord system makes it easy to connect with virtually any vehicle. The Save A Battery is easy to read and operate. It's a fact: batteries naturally discharge over time, even when not connected to a vehicle. If you own a classic car, RV, motorcycle, or any other vehicle that isn't used regularly, you may have experienced this first-hand. Not only is it frustrating, but a dead battery also costs you time and money to recharge or replace. The Save A Battery 24-Volt Battery Charger and Maintainer has a 50-Watt output that will charge a dead battery fast. Solid-state microprocessor technology provides the unit with twice the output and efficiency of older chargers that use transformer technology. This means less heat, less energy, and a greener world. Once the battery is charged, the unit switches modes to maintain and monitor optimal performance levels while extending its life by years. The modular design provides multiple connection options. The Save A Battery 24-Volt Battery Charger and Maintainer comes equipped with features to keep you and your vehicle safe, and is a snap to set up and use. It won't cause sparks when you connect it to your vehicle, and will alert you if it has been connected in reverse polarity. Over-current, over-voltage and short-circuit protection are also included. The bright LED bank makes it easy to monitor charging mode, connection status, and overall battery health. 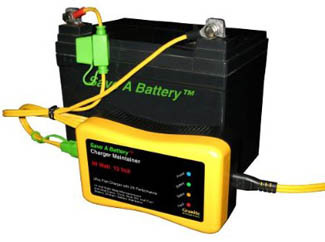 The Save A Battery 24-Volt Battery Charger and Maintainer also features an innovative modular cable design that makes it easy to connect to any battery or vehicle. You can choose to connect with the 5-Amp battery terminal lug cable or the alligator clip cable. Even the AC power cable is modular and removable. All cables come with gold-plated connectors that are suited for long cable runs and improved reliability in harsh environments. The bright yellow cable jacket is easy to see, and helps eliminate accidental disconnects. Additional cables (sold separately) are also available with different connection types and longer lengths. The Save A Battery 24-Volt Battery Charger and Maintainer comes with a 2-foot 5-Amp battery terminal lug cable, a 6-foot alligator clip cable, a 10-foot AC power input cable, and a mounting bracket for permanent wall or vehicle installation. Be the first to review “Save A Battery 2365-24 24-Volt Battery Charger and” Click here to cancel reply.